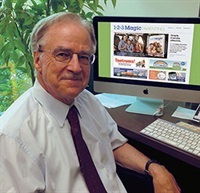 Thomas W. Phelan, Ph.D., is the author of numerous books, DVDs and audios, some of which include: 1-2-3 Magic: Effective Discipline for Children 2-12, 1-2-3 Magic for Teachers: Effective Classroom Discipline Pre-K through Grade 8, Surviving Your Adolescents: How to Manage and Let Go Of Your 13-18 Year Olds, and several others. In addition to writing and producing, Dr. Phelan maintains an active schedule of international lectures, and he is a frequent guest on radio and television. His articles appear in numerous regional and national publications. A registered clinical psychologist, Thomas W. Phelan, Ph.D. has worked with children, adults and families for over 35 years. He is a member of the American Psychological Association and the Illinois Psychological Association. Dr. Phelan received his Doctorate from Loyola University, Chicago, after completing his internship at the Loyola Child Guidance Center. He worked at the DuPage County Mental Health Center prior to entering into private practice. Dr. Phelan has also served on the boards of directors for both AODA and CHADD, two national organizations for the parents of children with ADD. He was inducted into the CHADD Hall of Fame in 1997. Dr. Phelan and his wife of 35 years raised two children and experienced first-hand many of the problems he now helps parents tackle. "My goal is to help parents avoid some of the turmoil we experienced, which I hear about from other parents every day", comments Phelan. "With some basic understanding of what makes children and teenagers tick--and a ton of patience parenthood can provide some of life's greatest satisfactions. Financial: Thomas Phelan maintains a private practice. He receives a speaking honorarium from PESI, Inc. Non-financial: Thomas Phelan is a member of the American Psychological Association; and the Illinois Psychological Association.